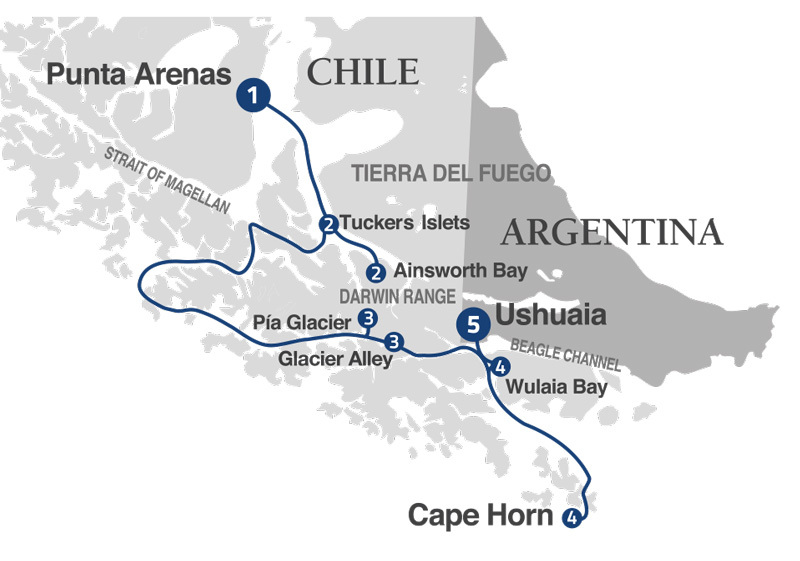 This itinerary starts and always returns to the same destination, taking off from Punta Arenas in Chile to return after 5 days of navigation. It also departs from Ushuaia on Isla Grande de Tierra del Fuego in Argentina also sailing for 5 days to return to the southernmost city in the world. In spite of this the routes differs. 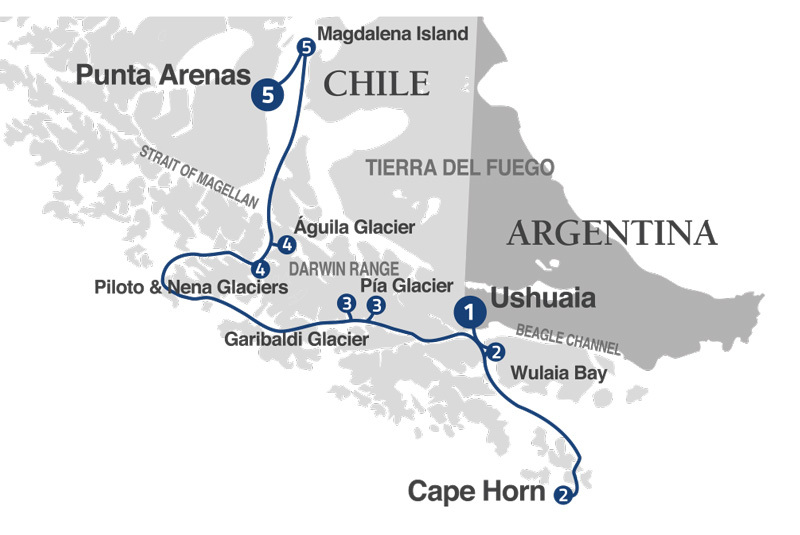 The journey that does - Punta Arenas - Punta Arenas goes to Bay Ainsworth, Piloto & Nena Glaciers, Seno Agostini & Aguila Glacier, Garibaldi and Pía Glaciers and Magdalena Island. Sailing around Cape Horn from Ushuaia to Punta Arenas and returning to Ushuaia and from Punta Arenas to Ushuaia returning to Punta Arenas, navigating the cold waters of the Strait of Magellan and the Beagle Channel on a round trip. Darwin's Route from Punta Arenas: The outer edge of the world awaits on an adventurous nine-day (eight-night) journey along the same waterways that inspired Charles Darwin. The itinerary retraces much of the route the renowned British naturalist took through the Fuegian Archipelago aboard HMS Beagle in the 1830s, a voyage that inspired him to write The Origin of the Species and formulate the theory of evolution. Departing from Punta Arenas, we’ll cross the Strait of Magellan to visit the Tuckers Islets penguin colony, wildlife rich Ainsworth Bay before cruising Patagonia down the Beagle Channel to visit Pía Glacier and sail through Glacier Alley. On either side of a half-day port call in Ushuaia, the ship stops at historic Wulaia Bay and fabled Cape Horn before returning to the Strait of Magellan and a shore excursion at Magdalena Island with its rowdy penguin colony.